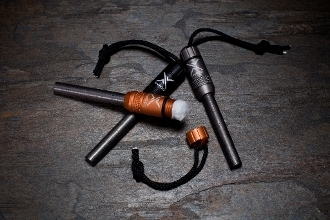 Pair the fireROD™ with one of the Habilis knives and a tinderTIN™ for an unbeatable fire it. We recommend petroleum jelly coated cotton balls for the ultimate fireROD™ tinder. Use the cotton ball on top of some tinderTIN™ fatwood shavings for the easiest fire you've ever started.